Is your garden being maintained properly and well? If you don’t have the time to take care of the plants and pathways in your lawn and outdoor green areas just give us a call and we will take care of them. 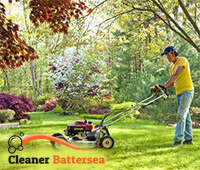 Our gardeners operate in SW11 providing effective lawn mowing, garden clearance, weed removal, hedge trimming, fertilising and many other services. If you need professional help with the growth and cares fro your plants get in touch with us and we will send any of our experts in landscaping and gardening. You can benefit from our flexible services which are affordable and implemented to meet the needs of each customer. Besides the mentioned above gardening services, we can offer you many others which will ensure the compact, better appearance and good condition of your plants. Our expert gardeners are supplied with suitable tools and machines that are the latest available on the market and guarantee effective work. You can call us to schedule the removal of weeds and unwanted plants, mowing of your lawn, trimming and shaping of the hedges and trees or other work. Contact our professional gardeners who work in the Battersea, SW11 territory seven days in the week including on bank holidays without additional fees. In case you have difficulties with the maintenance of any of your garden plants, you can contact us at any time and we will send our specialists to help you. They are punctual, bring the tools and machines they will need for the work and do it efficiently. 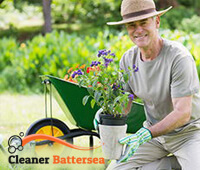 You can order one-off or regular garden clearance, weed removal, pressure washing and other services. Rely on our gardeners who are at your disposal in SW11 every day of the week to restore the nice and attractive appearance of your lawn, hedges, trees and plants. We provide effective and qualitative gardening services.